The start of July is a busy time for Darcy Regier, who has been signing players. Today he announced the signing of three more roster hopefuls. 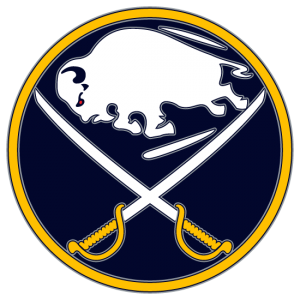 The Sabres now have forwards Kevin Porter and Mark Mancari in addition to the two forwards they resigned Rochester Americans goaltender David Leggio. All three players have been signed to one year deals. While playing at the University of Michigan, Porter won the Hobey Baker award as the top NCAA player. He is the third Sabres player to have won the award, joining goalie Ryan Miller and defenceman Jordan Leopold. Porter was originally drafted by the Phoenix Coyotes in the fourth round (119th overall) in the 2004 NHL Entry Draft. He played two seasons with the Coyotes where he split time between the NHL team and their AHL affiliate the San Antonio Rampage. He was traded to the Colorado Avalanche in 2009 where he would spend the next three seasons including his best season in 2010 where he played in 74 games and scored 14 goals and added 11 assists for 25 points. At 6 feet tall he brings the size the Sabres seem to be looking for this offseason and adds more depth at the centre position in the organization. Through 163 NHL games played, Porter has racked up 45 points (25 goals and 20 assists) and 48 PIM. It was reported by Amerks head coach Ron Rolston that unless Porter does something incredible in camp he will start the season in Rochester. Mark Mancari, a name that may sound familiar to fans, is back in Buffalo. He was originally drafted by the Sabres in the seventh round (200th overall) of the 2004 NHL Entry Draft. He made his debut with the Sabres in 2006-2007 and spent 6 seasons in Buffalo splitting time between the NHL and AHL. Last season he decided he would take his talents else where and signed a one year deal with the Vancouver Canucks. Mancari played just 6 games with the Canucks and spent 69 games with their AHL club the Chicago Wolves. In 69 games with the Wolves he racked up 58 points (30 goals and 28 assists) and 40 PIM. At 6 foot 3, 225 pounds Mancari is a very big player and have become known as an “AHL Allstar.” Hopefully he’ll be able to translate his game to the NHL in the future. In 42 NHL games the London Ontario native has racked up 13 points (3 goals and 10 assists) and 22 PIM. Leggio joined the Sabres organization in 2010-2011 after spending a year in Finland, the Sabres signed him as a free agent and he joined the Amerks. Last season, Leggio took over the role as the starter with the Amerks and set a career high playing in 54 games with a record of 28-24-2 and a 2.63 GAA. He led the AHL in saves (1,721) and was named the Amerks MVP for helping them reach the playoffs. Fans can look forward to seeing all three players at training camp battling hard to earn on spot in the NHL. Three solid signings by Darcy Regier that really helps add depth to the organization.